Shawn M. Eichinger passed away peacefully at home on Jan. 16, 2016. She was surrounded by her family whom she loved so dearly. She married Robert Eichinger in 1978 and together they had two beautiful children, Nicholas and Grace. Her greatest joy was her grandson Sam who was 22 months old when she passed. 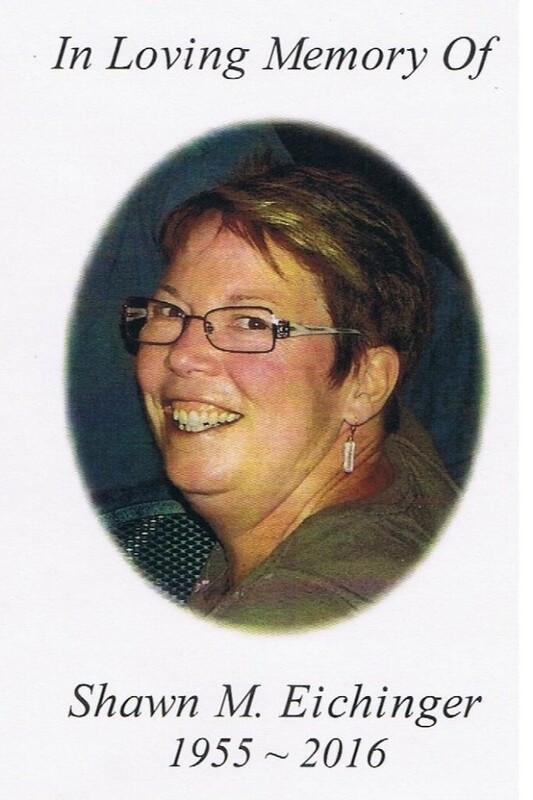 Shawn was devoted to her family and friends. A lifelong Michigan girl, Shawn was born in Roseville and was the oldest of six siblings. Shawn was always creative and expressed her artistic passion through dance, sewing, decorating, cooking, and crafting throughout her life. She loved to camp and create things. She collected cookbooks, teapots, and friends everywhere she went. On January 9, 2015 Shawn had brain surgery to remove a tumor. She had experienced her first seizure the previous month and was subsequently diagnosed with Grade IV Glioblastoma. Throughout her illness Shawn maintained her positive outlook and was a source of strength for her family and friends. In lieu of flowers, memorials are preferred to be directed to glioblastoma research at the Musella Foundation for Brain Tumor Research in Shawn's name at www.virtualtrials.com, or sent to Musella Foundation, 1100 Peninsula Blvd, Hewlett, NY 11557. When you make the donation below, we will already know it is In Memory of Shawn Eichinger and we will send an acknowledgement of your gift to the family.